By the end of the night, eight soldiers would be dead and more than 60 wounded — the largest casualty count in one day for the First Cavalry Division since Vietnam. The U.S.’s ranks of diplomats are losing key leaders at a “dizzying speed” as the State Department struggles to recruit talent amid a hiring freeze and sinking morale in the Trump administration, according to a new letter from a top ambassador. Sixty percent of the agency’s career ambassadors, the highest rank for diplomats, have retired or quit since January. Nearly half of career ministers — the next level down and equivalent to the military’s three-star generals — are gone too, down to 19 from 33. The next-level minister counselors have seen their numbers drop by 62 diplomats since Labor Day alone “and are still falling,” writes Ambassador Barbara Stephenson, the president of the American Foreign Service Association union. Without these leaders, the U.S. could face a diminished role on the world stage, unable to keep up with the increasingly aggressive foreign policies of rising countries like China, she argues. “There is simply no denying the warning signs that point to mounting threats to our institution — and to the global leadership that depends on us. There is no denying that our leadership ranks are being depleted at a dizzying speed,” Stephenson, who has headed the AFSA since 2015, writes in a new essay in the group’s monthly publication. AFSA rarely makes forays into political issues, making Stephenson’s letter that much more surprising. There has been a sharp impact on the next generation as well, AFSA reports. A department-wide hiring freeze prevents new employees from coming onboard and limits current employees’ ability to take on new roles, unless granted special permission. After 366 new foreign service officers were admitted in 2016, only about 100 will join in 2018, according to AFSA. What’s worse, they say, is that interest in joining the foreign service is plummeting now because of these policies. More than 17,000 people applied to take the foreign service test last year, but fewer than half that number have taken it so far this year. The implications of that trend could be felt long term, with a new crop of talented diplomats missing and unable to take the helm in a couple of decades, Stephenson argues. “The talent being shown the door now is not only our top talent but also talent that cannot be replicated overnight,” she writes. While the union and many outside the government as well are raising alarms about the situation, the president has made clear that he does not see the need to fill many of the roles or build talent. “The one that matters is me. I’m the only one that matters because, when it comes to it, that’s what the policy is going to be,” he said in a Fox News interview last week. That “redesign” began with an employee survey and hundreds of employee interviews, led by an outside consulting firm, to hone the department’s focus and mission, Tillerson’s team has said. Until it is complete, he has implemented that hiring freeze and left several top roles vacant or filled by staff in an acting capacity. But to foreign policy hands, he is depleting the nation’s diplomats, which will diminish America’s role on the world stage — or lead to a heavier reliance on the Pentagon at a time when the military is already stretched thin by two wars in Afghanistan and Iraq and Syria, as well as other hotspots around the world. 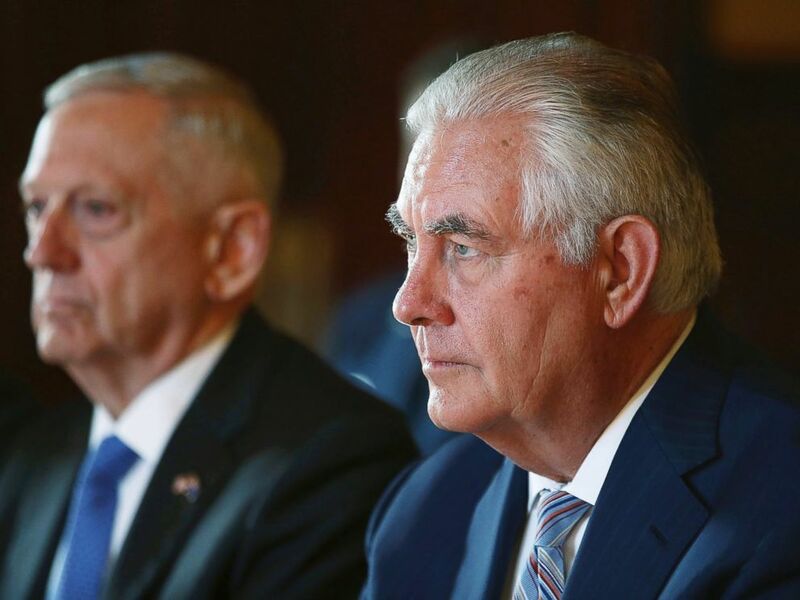 Tillerson and Mattis have worked closely in the Trump administration, with Mattis pointing out at every turn that Tillerson and diplomacy are at the helm on their North Korea strategy. It’s not just the loss of personnel or lack of hiring. There have been complaints about mismanaging talent as well. Politico reported Monday that the State Department has assigned “several hundred” employees to process public information requests, often known as FOIAs, because of a backlog that has built up over more than a decade. While the State Department would not confirm that number, an official told ABC News, “The current processing system just wasn’t working,” citing over 13,000 requests outstanding since 2006. Despite the criticism, the personnel moves seem to have satisfied Tillerson’s boss. “It’s called cost-saving. There’s nothing wrong with cost-saving. Rex is in there working hard. He’s doing his best,” Trump told Fox News last week. If Trump does seem to have any concern about staffing at the State Department, it’s that there are not enough of “his” people in the agency to implement in the “America First” vision he promised — agreeing with conservative commentator Laura Ingraham on this point in that Fox News interview. So far, the Trump administration has only seven high-level political appointees confirmed by the Senate and working in the department — outside of Tillerson but including USAID Administrator Mark Green and Deputy Secretary of State John Sullivan. An additional eight nominees are working their way through the confirmation process now, with the Senate either awaiting their paperwork or the nominees awaiting a Senate hearing or vote. But in the absence of Trump nominees, there are 30 senior roles filled by career diplomats in acting capacities. Although there is someone doing the work, they do not enjoy the full legal authority of their role or the image of speaking on the administration’s behalf to the world. There are 39 other senior roles that are vacant, but Tillerson has said he plans to eliminate 18 of those and fold their responsibilities into other jobs. The Trump administration has named a nominee for one of the 39 roles — the chief of protocol — who is awaiting confirmation. Nearly three dozen ambassadorships remain vacant as well, with the embassies’ No. 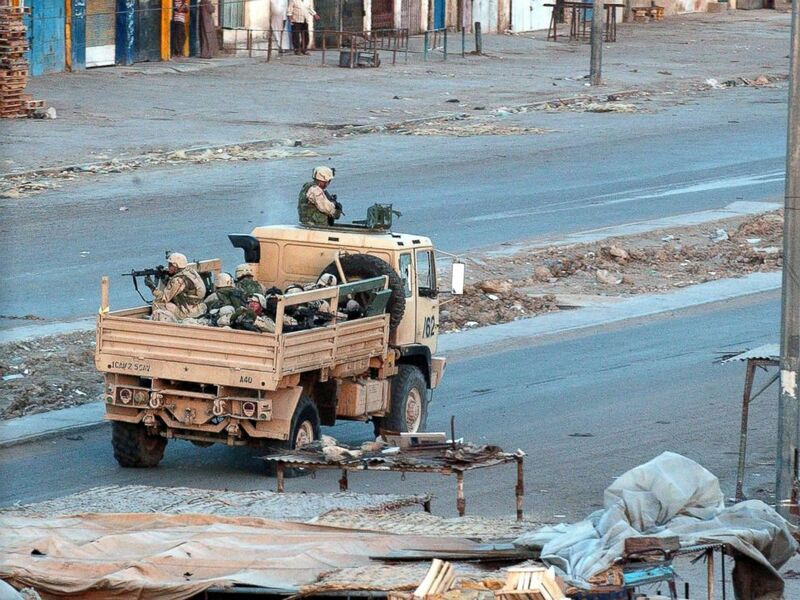 2, called the charge d’affaires, leading those U.S. missions. Nirbhay (the fearless) land-attack cruise missile, which can deliver nuclear warheads to a strike range of 1,000-km, after a string of failures since March 2013. The development is significant because the armed forces have long been demanding nuclear land-attack cruise missiles (LACMs), with ranges over 1,000-km and versatile enough to be fired from land, air and sea. Often brandished as India’s answer to the famed American Tomahawk missiles, as also an effective counter to Pakistan’s Babur LACM, the Nirbhay had been in the making for a decade without much success till now. The sub-sonic missile, designed to carry a 300-kg nuclear warhead, had failed during its first test in March 2013. Though the second test in October 2014 was a partial success, the third and fourth tests in October 2015 and December 2016 also flopped, leading to talk that the project may have to be scrapped. But the fifth test on Tuesday, at 11.20 am from the Integrated Test Range at Chandipur off Odisha coast, was dubbed a „complete success“ by DRDO. „The flight test achieved all mission objectives completely from lift-off till the final splash. The missile majestically cruised for 50 minutes, achieving the range of 647-km,“ said an official. Defence minister Nirmala Sitharaman, on her part, expressed „optimism“, saying the successful trial would take India into „the select league of nations that possesses this complex technology of sub-sonic cruise missile capability“. A series of successful tests of this ground-launched version of Nirbhay will pave the way for its induction into the armed forces, though its sea-based variant capable of being fired from nuclear-powered submarines will be the real game-changer. Ballistic missiles like the Agni follow a parabolic trajectory, leaving and re-entering the earth’s atmosphere before hitting their targets. Cruise missiles like Nirbhay, in turn, are designed to fly at low-altitudes, almost hugging the terrain, to evade enemy radars and missile defence systems. „Nirbhay has the capability to loiter and cruise at Mach 0.7 at altitudes as low as 100-metre,“ said the official. After an initial blast off with a solid-propellant booster rocket engine to gain speed and altitude, Nirbhay deploys its smallish wings and tail fins in the second-stage to thereafter fly like an unmanned aircraft. It’s designed to be highly maneuverable with „loitering capabilities“ to first identify and then hit the intended target with precision. The supersonic BrahMos missiles, produced jointly with Russia, have already been inducted into the armed forces. 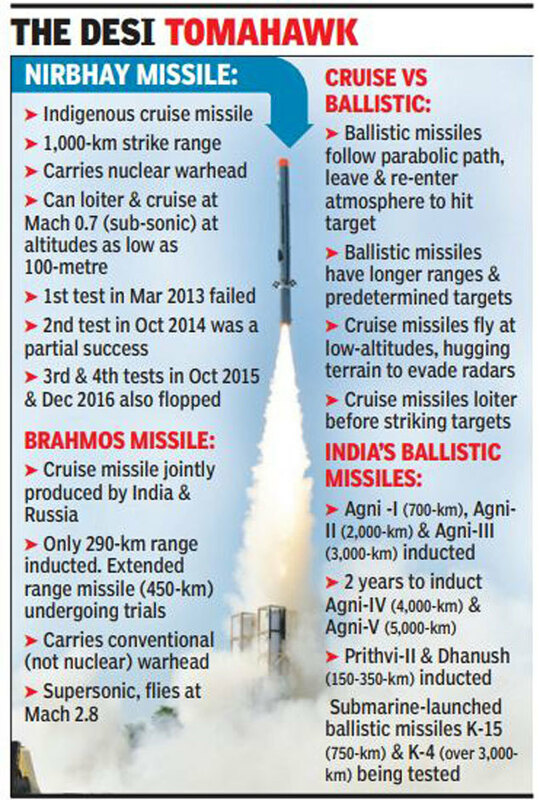 But the BrahMos, which flies almost three times the speed of sound at Mach 2.8, is meant to carry only conventional warheads and currently has a strike range of only 290-km. (MTCR) in June 2016. India, of course, has come a long way in developing nuclear-capable ballistic missiles like the Agni series, which have strike ranges from 700-km to over 5,000-km. South Korea is negotiating with the United States to buy nuclear-powered submarines to guard against threats from Pyongyang, local reports said on Tuesday, as President Donald Trump said Seoul would buy “billions of dollars” of US weapons. Nuclear-powered submarines can stay submerged for months, giving them a far greater range than their diesel-powered counterparts, and are also crucial to any seaborne nuclear deterrent. Such a purchase would redraw the balance of power in northeast Asia and could trigger a regional arms race. Japan, another US ally, does not have nuclear-powered submarines and is barred from having a military under its post-World War II pacifist constitution. And while China’s increasingly powerful navy does include them in its fleet, Beijing would undoubtedly be infuriated by any such acquisition by Seoul. After a summit in South Korea with his counterpart Moon Jae-In, Trump on Tuesday said Seoul would be buying a large amount of US weapons “whether it’s planes, whether it’s missiles, no matter what it is”. “South Korea will be ordering billions of dollars of that equipment, which for them makes a lot of sense and for us it means jobs, reducing our trade deficit with South Korea,” he said. While Moon did not give specific details of the purchases, he described them as essential for national defence. 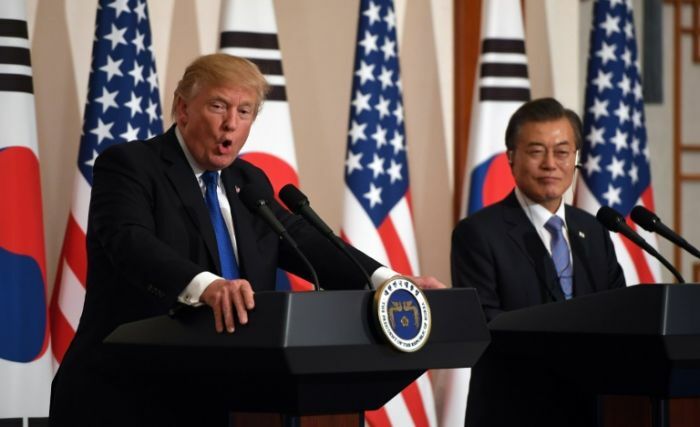 Multiple South Korean media outlets said the two leaders ordered officials to begin the purchase talks “immediately”, citing a senior official who gave an anonymous briefing. “The strategic assets under discussion include a nuclear-powered submarine and a sophisticated surveillance asset,” the reports quoted a senior official of Moon’s office as saying. 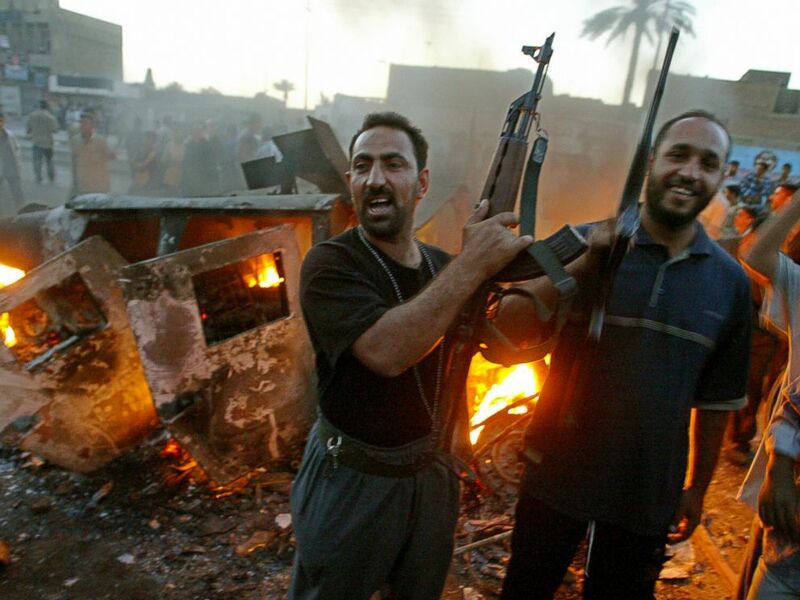 “We will have close consultations with the US about these two in the future,” the official was quoted as saying. Seoul heavily relies on its security guarantor Washington, which has 28,500 troops stationed in the South, for national defence to protect itself against potential attacks by the nuclear-armed North Korea. But growing atomic and missile threats by the North in recent years prompted calls in the South to have more sophisticated weapons of its own, with some even demanding that Seoul develop its own nuclear weapon. The country is currently barred from developing atomic weapons under the deal with the US, which in turn offers Seoul “nuclear umbrella” against potential attacks by the North. Pyongyang staged a sixth atomic test in September and has test-launched multiple missiles capable of reaching the US mainland, sparking global alarm over its military ambition. Trump also said the US had agreed to remove a 500-kilogramme warhead weight limit on Seoul’s ballistic missiles. The allies had agreed in principle to do so in September following the North’s latest nuclear test, by far its most powerful to date. Moon, noting “ever-growing threats” from the North’s missiles and nuclear weapons, said on Tuesday that the two allies had reached a “final agreement” to remove the restriction. “We also reaffirmed our stance to put maximum pressure and sanctions on the North until it… comes forward for genuine negotiations,” he told reporters.